This particular trip I just took put me in this particular bind yet again. However, the first time I flew to Europe via Canada, I was very pleasantly surprised at the gluten-free meal. This one (not the one seen above, more on that later). Yes, I said pleasantly. Honestly, the chicken business was not at all bad, and the gluten-free bread was absolutely passable. The cookie? Even good. The quinoa and corn salad was damn near inspired. You guys, when I told my husband about my meal he was jealous. Plus, when you request the “special” meal you get served before everyone else. Take that, first class. 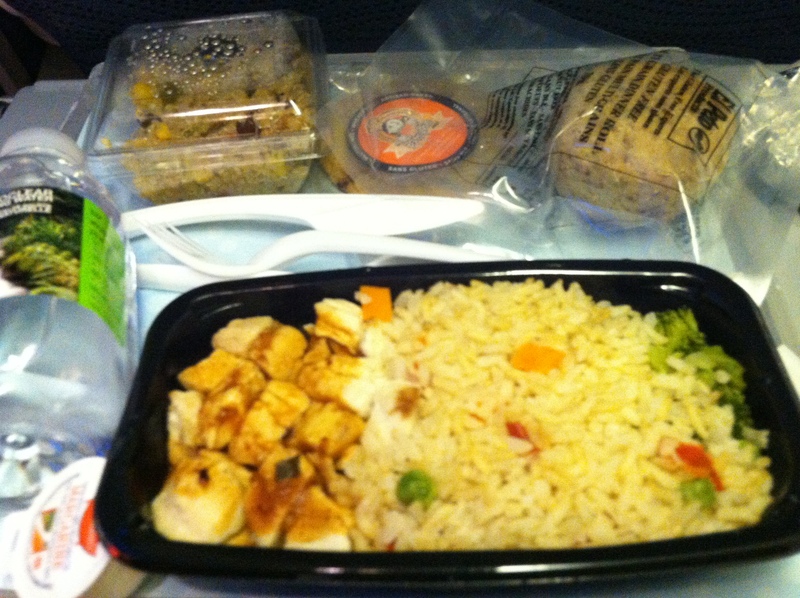 So yeah, I was pretty impressed with Air Canada’s gluten-free meal. At least on my outgoing flight. Let’s take a look at what I was in for after a week of near starving in Paris, shall we? What the hell is that? I ate it, and I still don’t know. Well, I tried it and when I could not identify the yellow stuff (eggs, grains, tofu?) I abandoned it for the soy vanilla pudding. So let’s talk about that entire plate of fish products in the first photo. While my husband was all, “What’s your gluten-free problem?” I couldn’t eat that one either. I personally don’t trust fish unless I cook it myself or dine in a farm (sea? )-to-table type restaurant. Yes, I know I shouldn’t have so many food hangups. When you’re a begger, or a gal with high expectations from her airline food, you have to take what you can get. Yet, I turned my nose up at this gluten-free meal for ridiculous reasons. I know. Needless to say I got to the Toronto airport and ate the first cheeseburger sans bun that I could find. You know, since my cheese from France I had stuffed in my carry-on was getting a little ripe. But now you know the deal. That is the Air Canada deal, about gluten-free airline dining. Yep, you should still pack your own. Tags: gluten free travel, gluten-free airline food. Bookmark the permalink. Ha! Devon, maybe that’s where I got the psychological block. Not sure I would have been as brave as you in even trying the fish or egg? meal. The other one didn’t look too bad. Oh poor you, after being tortured in Paris by the elusive and apparently nonexistent GF croissant (it’s just wrong that the place known for pastry should have such few GF options) that you should be additionally starved on the plane. I just hope that crepe place didn’t let you down! Dana! It said on the website of Paris closings that West Country Girl would be open on the 27th. I went down there, and alas, the sign in the window said they would reopen on the 30th. Today. Just as I got back home 😦 But I did find a buckwheat crepe place! More info on THAT awesomeness later. And thanks for the suggestion. 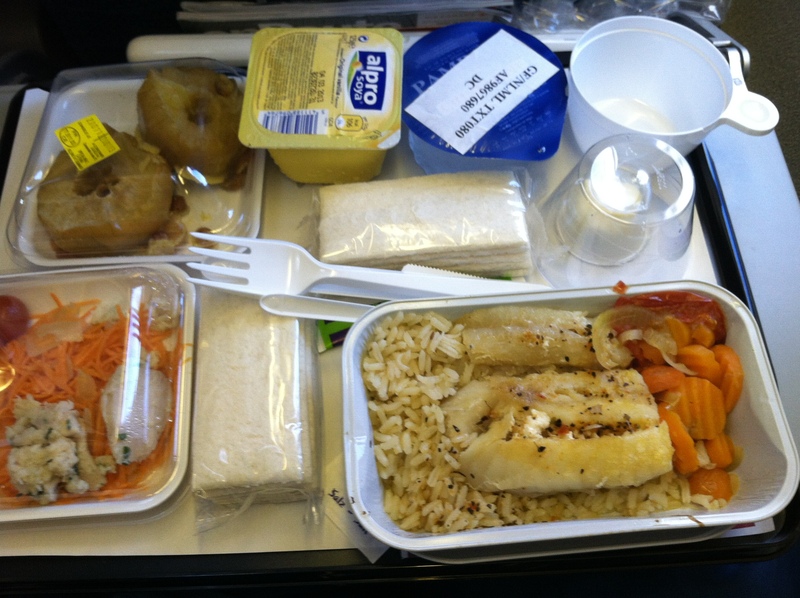 We flew Air Vanuatu a couple of years ago, and the travel agent assured me that they would have a Gluten free option as long as we paid extra and flew first class.The extra $$ did in fact assure me a gluten free meal consisting of a tub of yoghurt and a banana…. So yeah, pack your own is now my motto. 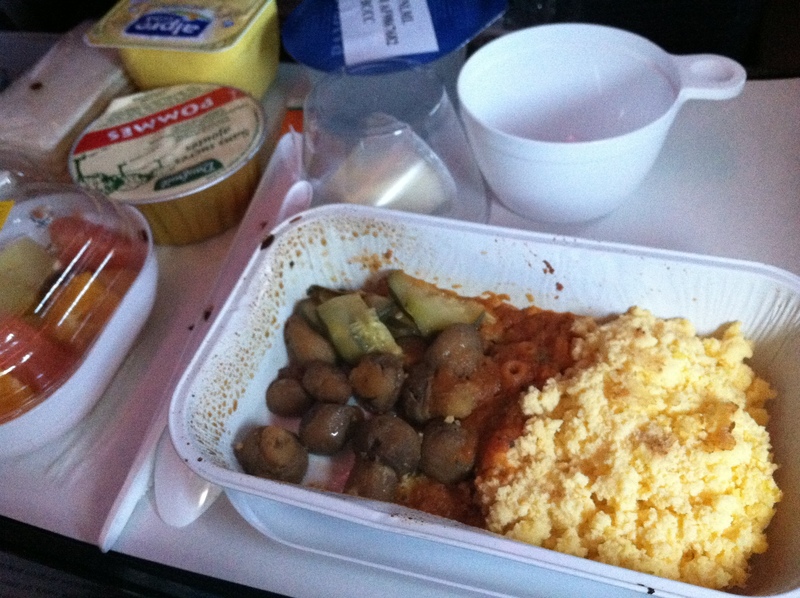 Two years ago we flew to Switzerland via Air Canada and our meals were spectacular. My daughter was 8 years old then and was so excited by the amazing gluten free food placed in front of her on the airplane. Thank you Air Canada. we wouldn’t be packing a Go Picnic on your airline! So funny that you took pictures of the food! I have never had a good experience on an airline, but I do really appreciate it when the flight attendants at least show sympathy and don’t just shrug their shoulders when someone’s forgotten my special meal request.